1. Obtain a pre-approval from your lender. Note, not all lenders provide construction loans, or construction-perm loans. Focus Homes, our sister company, can direct your to lenders that can provide this loan service for you. 2. Design your custom home with your builder of choice. At Focus Homes customers typically only invest $790 - $990 for a set of preliminary one-of-a-kind plans which include a floor plan design and an elevation. The amount depends on the size and scope of the custom home. Smaller 1300 SF homes should expect to pay less than larger 5,000+ SF homes for example. These plans are used for estimating and financing purposed. Required engineered and "permit ready" plans are included in the construction agreement and do not require additional out of pocket funds. These plans are usually drawn later in the process when the home is about to be permitted for construction start. 3. Compile a list of features and specifications with your builder. These items included desired cabinet styles, countertop materials, desired flooring types, and lifestyle features like pools, outdoor kitchens and fireplaces and the like. There are no "standard features" with Focus Homes as all homes are unique. Don't worry though, the building experts will help guide you in the process to help you keep within your established budget. 4. Complete estimates, obtain bids and prepare for the building agreement. 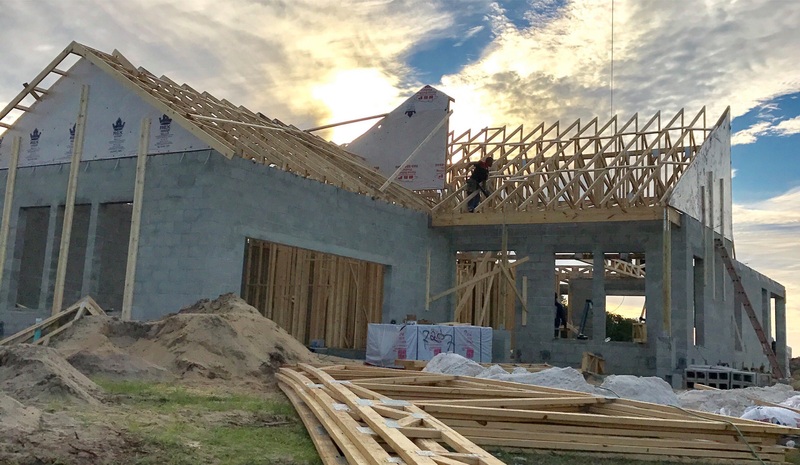 This process may take a couple of weeks while the builder confirms pricing with vendors and suppliers and has any specialty items accounted for in the custom home budget. Once you the customer and the builder come to an agreement on the entire scale, scope and project investment, you will complete a building agreement which will later be submitted to the lender for construction-perm loan approval. 5. Submit your custom home project to the bank for approval. You and your builder will submit the plans, elevation, land info (which often includes a land contract and survey), and building agreement to your construction-perm loan lender. The lender will obtain an "as built" survey, establish a value for your home, on your land, with your specific included features, and approve you for a loan based on that value. 6. Prepare and close your construction-perm loan. Once your custom home is approved there is a closing of the construction-perm loan. This is typically a one time close. "Closing" is an ironic term when you want to build a custom home in Lakeland because you are actually "opening" the construction funds account so that construction can begin. If you are buying land it is paid off at this time. At this closing the builder usually obtains "start up" funds which are used in permitting, paying government fees and for expenses that are incurred to get your new home going. 7. Distribute draws as your custom home is constructed. Construction-perm loans are a little different than purchase loans because you only pay interest on the amount that is used as your home is being built. It's much like a credit card. For example, a credit card may have an available credit limit of $5,000, and a balance owed of only $1,000. You are only charged interest on the $1,000 of outstanding balance. Your construction loan balance grows each month as the builder continues to construct your house. As the home is being constructed the builder asks the bank for a "draw" from the loan to cover those expenses. Near the end of the project, your outstanding balance will be very close to your final mortgage amount. 8. Modify your construction-perm loan. At the end of construction, when everything is done and you are ready to move in, the lender will "modify" your construction-perm loan. It will go from being an interest only construction loan into being your long term mortgage home loan. Your monthly house investment will now include principal, interest, (taxes and insurance if applicable) for the time frame already agreed upon with your lender at the beginning of this process. 9. Start enjoying your new life! All the loans are taken care of. The builder is paid. You have the rest of your life to look forward to. Enjoy! We know that this is a lot of information to absorb. If you would like a complimentary consultation, please call or text Jared at 863-640-2246, or contact us online to request a time to speak more fully, in person, together.